There is not a lot of room to do the splits on a submarine, but fortunately JCVD has plenty of others moves. As CIA counter-intelligence operative Scott Wheeler, he has been framed and renditioned to a super-secret sub-bound interrogation center by the very turncoat he was trying to root out. Basically, its Under Siege on a submarine (not that that’s a bad thing) in Pasha Patriki’s Black Water (trailer here), which is now available on DirecTV and opens this Friday in New York. Wheeler and his partner-lover Melissa Ballard have recovered an encrypted flash drive with some kind of NOC-listy Macguffin from the treasonous cabal, but alas, the bad guys have the drop on them. They take out Ballard, but they have to capture Wheeler alive to recover the drive. Of course, he can take whatever the by-the-book Agent Ferris can dish out, at least until the legit interrogator is whacked by Wheeler’s old mentor, Edward Rhodes. By doing so, he pretty much reveals himself as the mole. Wheeler, along with the two surviving honest CIA agents will play Die Hard games with Rhodes and the mercenaries administering the prison portion of the sub. Strict firewalls are in place sealing off the military crew from the civilian wardens, but both Wheeler and Rhodes will try to devise ways of making contact. Wheeler also finds an ally in “Marco,” the huge mysterious German prisoner in the cell next to his. 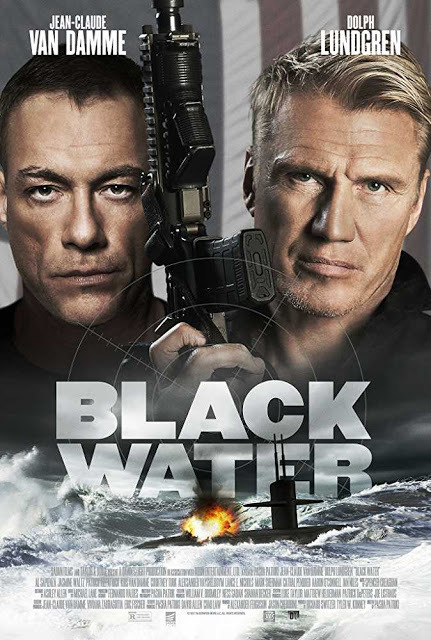 Even though Black Water is all about rendition and off-the-books facilities, it doesn’t seem to give a gosh darn about any of that, as long as the good guys are in control. No doubt, critics from The Guardian and Pravda will give it a stern lecture about the wasted opportunity to make political statements, but Patriki and screenwriter Chad Law understand everyone’s time is better spent administering beatdowns to duplicitous traitors. Van Damme looks a little weathered around the eyes these days, but physically he is still probably the best conditioned of his class of 1980s action stars. Frankly, it is pretty easy to buy into him as a lean, mean fighting machine, unlike Steven Seagal. Dolph Lundgren also still looks big and muscular—and he continues to generate good will with his affable screen presence. Frankly, we think it is high time for the Academy to recognize Lundgren for his contributions to action cinema and his activism fighting human trafficking, but don’t hold your breath. As a bonus, the supporting cast is pretty solid, especially by genre standards. Al Sapienza chews the scenery with a fair degree of verve as the villainous Rhodes. John Posey looks and sounds spot on as the submarine skipper, Captain Darrows and Courtney B Turk generates plenty of heat with Van Damme as Ballard. Van Damme and Lundgren really deserve credit, because they keep working regularly and they sufficiently take care of themselves and their images to maintain their action hero cred. Black Water is a fine example of that. Scoff all you like, but it is hard to resist the film’s meathead charms. Recommended for old school fans, Black Water opens this Friday (6/29) in New York, at the Village East.